Northwest Seaport Alliance (NWSA) recently took the critical first step to usher in some of the biggest ships in North America to the Port of Tacoma. In August, the NWSA and the U.S. Army Corps of Engineers (USACE) inked a cost-sharing agreement that calls for a feasibility study of navigation improvements to the Blair and Sitcum waterways. A big focus of the study will be on deepening Port of Tacoma waterways to make them big-ship ready. “With the signing of these documents, we begin this project to deepen the South Harbor as part of our effort to develop what will be one of the deepest gateways in the nation,” said NWSA CEO John Wolfe in a press release. The partnership with the USACE, Wolfe said, is vital for building a stronger trade gateway and keeping ship calls-and the jobs they support-in the Pacific Northwest and U.S. The study will determine if there’s federal interest in participating in the modifications. The NWSA and USACE anticipate that deepening the waterways may save time and money. There’s a potential for lower project maintenance costs, and the modifications may remove draft restrictions for certain vessels. Megaships have made a big splash in recent years. The ships have a cargo capacity of more than 20,000 containers. 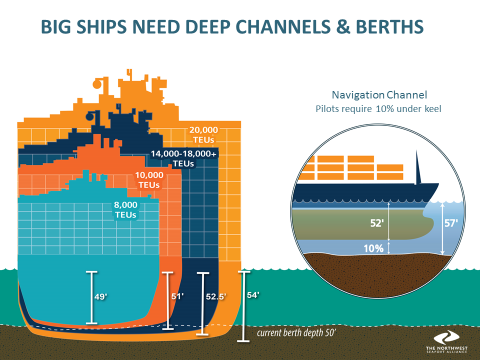 At a depth of about 51 feet, Port of Tacoma waterways can accommodate ships that hold up to 10,000 containers.